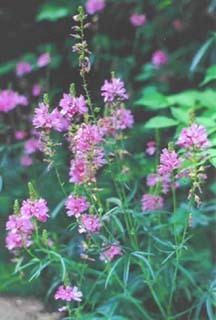 Description: a showy perennial with brilliant pink flowers (late spring, early summer) clustered at the top of stems (8-60"). 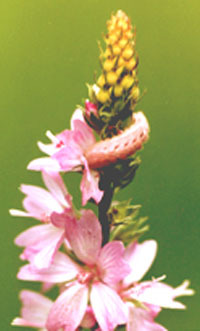 Checkermallow resembles a small hollyhock. Plant it with blue-eyed grass, lupine, and irises for a colorful border. Butterfly favorite. Sidalcea is used as a host plant by the Grey Hairstreak, among others (left, in Larry Everson's Milwaukie garden, adorned with matching larva!). Sun/part sun, regular water (will tolerate less).